Walt Disney's second full-length animated feature is a timeless, breathtakingly beautiful classic. 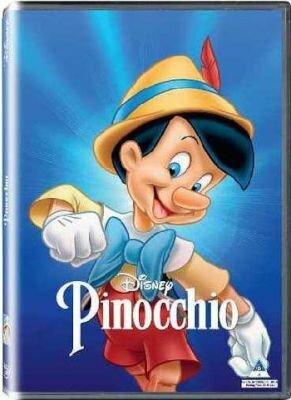 Based on an 1800s story by Carlo Collodi, it stars Jiminy Cricket (voiced by Cliff Edwards) as a vagabond insect who spends a rainy night at the shop of toymaker Geppetto. The Blue Fairy brings a marionette to life after Geppetto wishes on a star for a son, and Jiminy Cricket is appointed the new boy's conscience. He has a devil of a time keeping up as Pinocchio is willingly lured through various forms of temptation, the most frightening of which leads him to Pleasure Island, where he drinks, smokes, and is almost turned into a jackass. This sequence, as well as Pinocchio's brave rescue of Geppetto from the belly of a whale, ranks among the most memorable in the history of animation. With such songs as "When You Wish Upon a Star," this is about as magical as cinema can get, a sublimely beautiful coming-of-age story for all to treasure.